Yavuz Gallery is proud to present Flying in the Fragmentary, the first solo exhibition of Myanmar artist Nge Lay with the gallery. The exhibition features one large-scale installation, the titular artwork transforming the gallery into an immersive, life-sized Myanmar classroom from Thuye’dan village, a remote area ten hours north of Yangon. 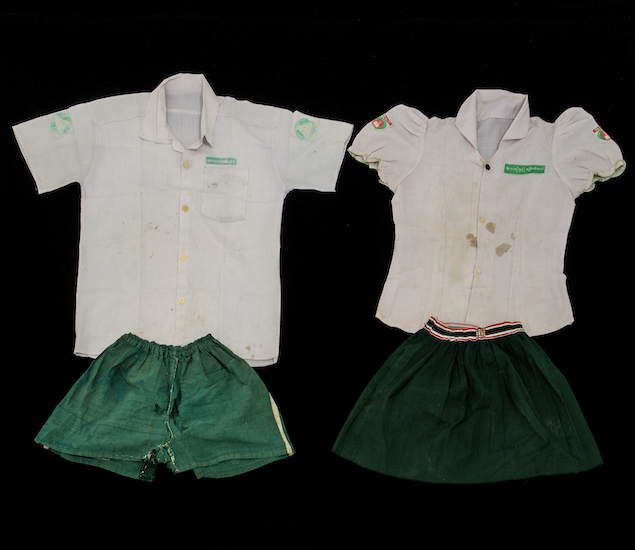 The work consists of thirty hanging rattan mannequins wearing the classic Myanmar school uniform – white on top and green on the bottom, alongside rows of blackboards, stacks of local textbooks, traditional schoolbags and a video of village students. 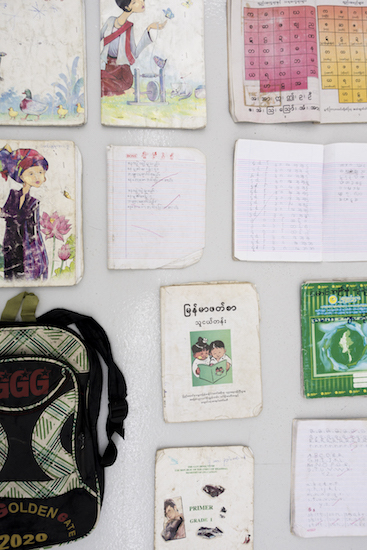 The uniforms, schoolbags and books are sourced from Thuye’dan, where the artist has been regularly visiting since 2007, and basic lessons and poems from First Grade textbooks feature on the blackboards. Flying in the Fragmentary is the culmination of the artist’s ongoing investigation on Myanmar’s state of education, spurred by the birth to her first child four years ago and worries about her future. 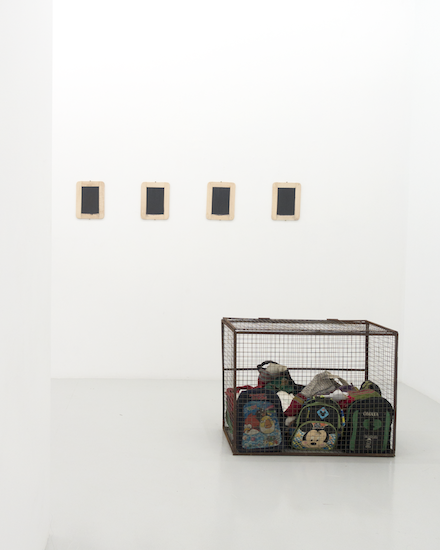 The exhibition is the artist’s invitation to enter and connect with the school system in Myanmar, a fragmented and unsystematic institution, further exacerbated by divides in development between urban and rural areas. 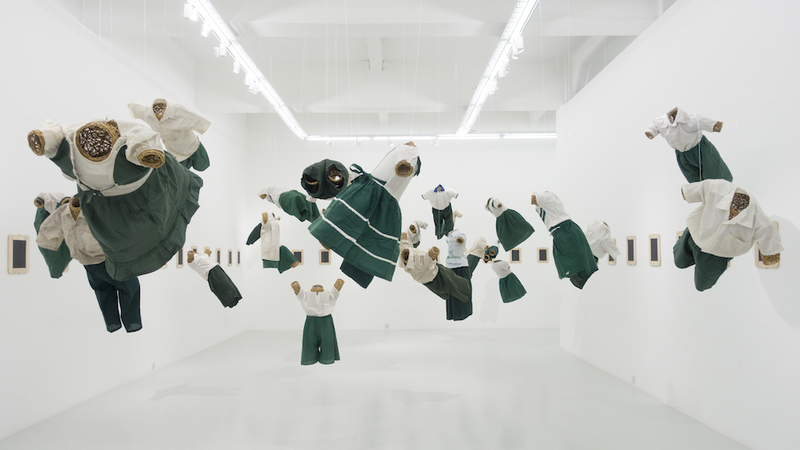 The artist describes it as a “laboratory education”, due to its experimental and turbulent nature over the past few decades. Myanmar’s education system has suffered severely since the military coup of dictator General Ne Win in 1962, and the subsequent watershed student demonstrations of 1988 resulted in strict censorship of the education system, which continues to struggle today.